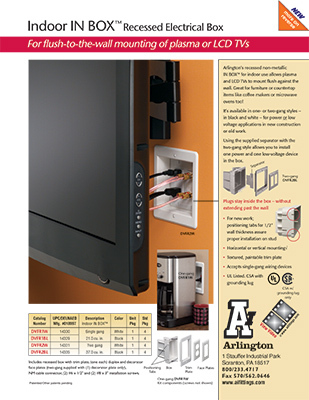 Arlington's recessed non-metallic INBOX™ for indoor use allows flat-screen televisions (LED, LCD, etc.) to mount flush against the wall. Great for furniture or countertop items like coffee makers - and microwave ovens too! It's available in one (DVFR1) or two-gang (DVFR2) styles in both black and white—order DVFR1W for white or DVFR1BL for black. Our recessed indoor INBOX™ works with power or low voltage applications, in new or existing construction. Using the supplied separator with the two-gang style, allows you to install one power and one low voltage device in the box. Plus, plugs stay inside the box—without extending past the wall. Our DVFR1 and DVFR2 mount both vertically and horizontally for added convenience and versatility. For new work, positioning tabs for 1/2" wall thickness assure proper installation on studs. Both our single and two-gang models accept single-gang wiring devices.